This single was released in the UK and Norway only and was Morten's first release on the record label "BMG Arista". The title track was written by Morten with additional words by H�vard Rem and Ole Sverre Olsen, produced by Steve Lovell and mixed by Simon Vinestock. The cover of the 5" CD has a colour close-up picture of Morten's son Jakob. "Morten Harket" is written in `hand-written' pink letters along the top and the title is in white underneath, while part of the lyrics are written in beige along the bottom. The spine is navy blue with titles in blue, pink and white. The reverse of the insert is navy blue with the titles written in large blue letters in the background. The track listing is in white along the top and additional text is in pink underneath. Furthermore, there is information on the record company in the bottom right corner. 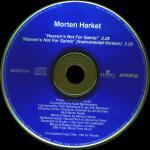 The CD is also navy blue with pink "Morten Harket" plus text at the bottom and other titles in silver. The CD features "Heaven's Not For Saints [Let It Go]" (3:28) and the instrumental version (3:28). The CD was made in the EC. There is also a 5" promo CD. It comes in a clear PVC sleeve, but has no picture insert. The disc is of a metallic royal blue colour with silver titles and "Promotional Copy Only - Not For Resale" is printed on the disc. The cassette single features the same picture as the CD-single, with some of the song lyrics printed along the bottom of the picture. However the title is printed above the picture on a dark blue background in the same colours (pink and white) as the CD-single. The spine is dark blue with the title printed in pink and white. The insert at the back is `full length' so the whole insert is 10cm x 21cm when opened. The back is dark blue with purple blue title in the background, titles in white in the lower part of the sleeve and other text about BMG in bright blue at the bottom. The inside flap of the insert is dark blue with a lot of pink text concerning the production while the track listing is written in white at the top. The cassette is clear with titles in white and it plays the same on both sides. Norway? 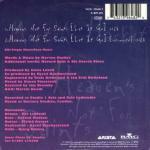 : There is a 2-track version of "Heaven's Not For Saints" which comes in a card sleeve. The design of the sleeve is similar to the UK release, but the catalogue number is different. Taiwan: The UK release was used as a promo(?) in Taiwan and comes with a white, yellow and blue information label on the cover.